Exhibits kept at the National Museum of Natural History in the national capital have been destroyed in all probability due to the massive fire that swept through it, officials have said. "It was a priceless collection. And now it is all gone. It is a very sad development indeed," Vikas Rana, Educational Assistant at the Museum told Down To Earth. 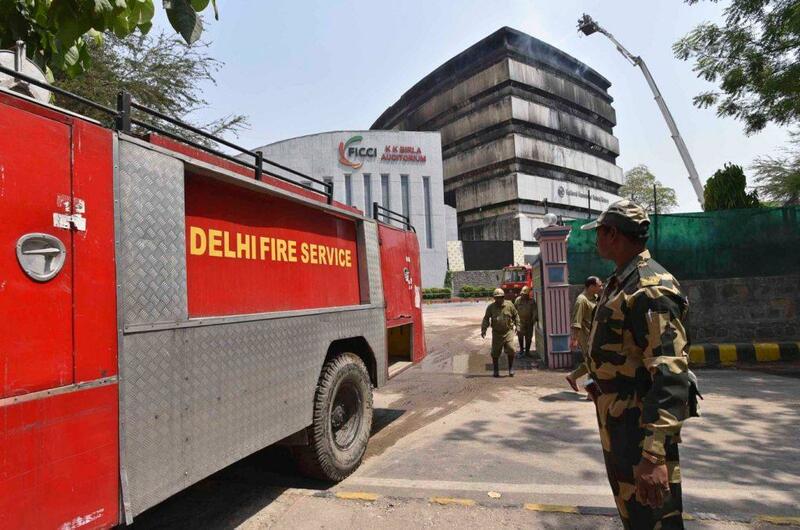 Fire tenders were first called to the site in the capital's Mandi House neighbourhood at around 1:45 am on Monday night. The building is made up of six floors. The ground and first floor house the auditorium of the Federation of Indian Chambers of Commerce and Industry (FICCI). The second and third housed galleries displaying the exhibits. There was a library at the fourth floor with some 15,000 titles. The fifth and sixth floors housed office spaces of the museum staff. "The blaze began at the sixth floor and spread till the first," said Rana. According to fire brigade officials, more than 40 fire tenders were required to fight the blaze. Among the exhibits were fossils of dinosaurs that once used to roam the Indian landscape. "We had the femur bones of sauropoda and their eggs. There were also fossils of ammonites, an extinct group of marine mollusc animals," said Rana. There were also taxidermy or stuffed exhibits of dead animals. "The specimens were mostly of the flora and fauna of the Indian Subcontinent—fish, mammals, amphibians, reptiles and birds. There were lions, tigers, deer, birds, snakes," Rana said. According to Rana, the museum was inagurated by late Prime Minister Indira Gandhi on June 5, 1978 to promote environmental awareness. "It was the first and only natural history museum in India. We have regional Museums of National History in Bhopal, Bhubaneswar, Gangtok, Mysuru, and Sawai Madhopur," Rana said. When asked as to what would be done to replace the destroyed collection, Rana said the decision would be taken by the Union Ministry of Environment, Forest and Climate Change, under whose aegis the museum falls.